These talks are led by Special Envoy of the genocide supporting United Nations, Martin Griffiths. The Houthis for some reason aren’t allowed to tell their side of the story. There are also no plans to stage elections in Yemen, with more than 1 candidate preferably, as the so-called “internationally recognised” president isn’t supported by the Yemen population. Maybe some political experts can explain that it’s democratic that the terrorist UN decides who becomes president instead of the population. I think that this is a good moment to give some attention to Martin Griffiths... who’s from Britain. Griffiths is the executive director of the Brussels-based European Institute of Peace (EIP) – you have to understand “peace” in an Orwellian way to understand what kind of “peace” Griffiths works for. Last month, US Congressmen tried to get some media attention with a new resolution to supposedly “limit” the US support for the genocide by the “coalition”. The resolution was rejected. At least 5 of the 37 Republican senators that voted against the resolution - Tim Scott, John Boozman, Roy Blunt, Richard Burr and Mike Crapo - got some of that sweet Saudi money in 2016 and 2017 (nothing on the UAE!). The Armed Conflict Location and Event Data Project (ACLED) has estimated that, with an additional 3,068 people killed in November, the total number of Yemenis who have died from the violence in Yemen since January 2016 is 60,223. According to US defense officials, the Pentagon has been fueling Saudi and UAE jets, since the war against Yemen was intensified in March 2015, free of charge due to "errors in accounting where DoD failed to charge". This means that US taxpayers have been paying for a major part of the “coalition” campaign against the poor Yemenis. It was found out after Jack Reed, along with 7 other Democratic senators, made a specific request for information in a letter to Defense Secretary Jim Mattis in March (it took 9 months to answer...). The Pentagon admitted making “errors in accounting”. It is clear that the Department has not lived up to its obligation to keep Congress appropriately informed or its responsibility to secure timely reimbursement. The exact costs aren’t known yet, but according to Jack Reed likely "tens of millions of dollars" worth of fuel was supplied to the “coalition” for free. Retired Dutch general Patrick Cammaert - who arrived in Hodeidah on Sunday - is heading a committee to monitor that the Houthis will conform to the truce. In July, Saudi Arabia agreed to lend $2 billion to the puppet government central bank office in Aden. Money has been directed away from Houthi-controlled areas where most Yemenis survive and most food imports arrive. Deputy Governor Shokeib Hobeishy said that only $340 million of that money has been used, but it was unclear how much had reached companies to import food. Carefully ignoring that the coalition bombs food and drinking water, while the Central Bank of Yemen’s puppet government “forgets” to buy food for the Houthi controlled areas. Since the Houthis came to power, looting has been on a large scale. This is why the poor get nothing. What really arrives to people is very little. The only patriotic thing, if you care about our troops, if you care about American interests, if you care about the outrage that the Saudis are inflicting on Americans and on the world, then the only patriotic thing to do is to vote for this resolution. In December, the Senate passed a similar resolution 56-41 that was then blocked by House Republicans who prevented it from reaching the floor of the House. That was the first time the Senate had ever used their congressional authority under the War Powers Act of 1973. 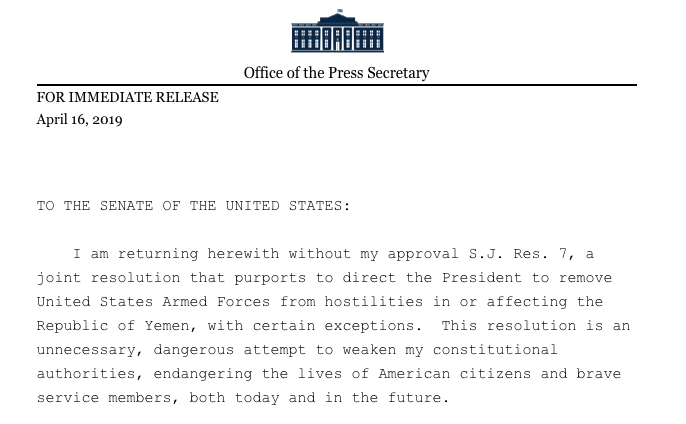 The White House called the resolution “flawed” because US forces are not directly involved in hostilities in Yemen and warned the bill would “harm bilateral relationships”. 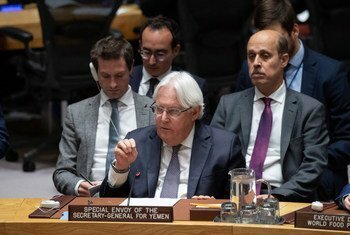 Our continued cooperation with regional partner nations allows the United States to support diplomatic negotiations to end the conflict, promote humanitarian access, mitigate civilian casualties, enhance efforts to recover United States hostages in Yemen and defeat terrorists who seek to harm the United States. Morocco says it stopped taking part in military interventions in the war on Yemen, and recalled its ambassador to the kingdom amid rising tensions between Riyadh and Rabat. Before Morocco, Malaysia had already withdrawn its forces from the coalition amid international “outrage” over the heavy civilian toll. After Moroccan Foreign Minister Nasser Bourita talked about having serious reservations about Saudi Crown Prince Mohammed bin Salman, Saudi channel Al-Arabiya aired a documentary supporting claims that Morocco invaded the disputed Western Sahara after Spanish colonizers left in 1975. In 2016 and 2017, the Pentagon, despite repeated denials, was involved in providing intelligence and training to the coalition for combat in Yemen, including to United Arab Emirates troops. This was exposed by documents obtained through the Freedom of Information Act. In January, the Trump administration approved another $195 million in upgrades to Saudi Arabia’s missile defense system. Yemenis are so desperate that they sell their underage daughters to dirty rich men or sell their organs so they can eat. How many Yemeni have died already? If the warnings since 2016 that Yemen is on the brink of famine are true, the death tole could easily already be in the millions!!! The following shocking video shows the severely malnourished 12-year-old girl Fatima Qoba, who weighs only 10 kilograms (22 pounds). The family of 11 children and their father fled their home near the Saudi Arabian border and are now dying under a tree. The head of the clinic, Makiah al-Aslami, said Fatima is “skin and bones due to the hard life of her family” . Al-Aslami expects that the devastation will become even worse. The United Arab Emirates (UAE) just inked $3.2 billion worth of weapons with western arms companies at just the first 2 days of an arms expo. Jeremy Hunt is the first British foreign secretary to visit Yemen, the port of Aden, in more than 20 years. Hunt unashamedly showed his support for the genocide by the Britain-supported “coalition”. And that UNICEF in 2017 predicted that 150,000 children could die by the end of that year. This also explains that Yemeni President from 1978-2012 Ali Abdullah Saleh was ousted and later murdered as he always opposed this. The US Senate has (finally) approved the resolution, by a 54 to 46 vote, to put an end to Washington’s support for the war in Yemen by the “coalition” that started in March 2015, including targeting support for airstrikes. House Democrats intentionally derailed the process by supporting a procedural motion offered by Republicans to declare the chamber’s opposition to anti-Semitism. By attaching an unrelated amendment to the Yemen resolution, the House ended its “privileged” status, which would have forced the Senate to quickly take it up and send it to Trump.